Zuill Bailey, is a distinguished soloist, recitalist, chamber musician, artistic director and teacher. 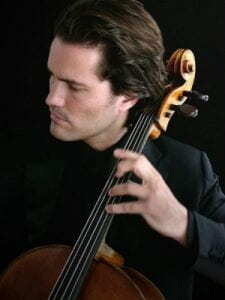 His rare combination of celebrated artistry, technical wizardry and engaging personality has secured his place as one of the most sought after and active cellists today. Recent career highlights include appearances with orchestras such as Los Angeles, Chicago, Detroit, Minnesota, Israel, San Francisco, Toronto and the Philharmonia with conductors Itzhak Perlman, Carlos Kalmar, Jun Markl, Stanislav Skrowaczewski, Alan Gilbert, Krzysztof Urbanski, Andrew Litton and James DePriest. Johns Hopkins University honored Zuill Bailey as their Distinguished Alumni for 2014. An internationally renowned recording artist with over twenty titles, Mr. Bailey’s extensive discography includes the “Bach Cello Suites” and recently released Britten Cello Symphony/Sonata with Natasha Paremski, both of which immediately soared to the Number One spot on the Classical Billboard Charts. Other celebrated releases include the complete works for cello and piano of Brahms and Beethoven, in addition to concertos of Tchaikovsky, Shostakovich, Dvorak, Elgar, Haydn, Schumann, Korngold, Saint-Saëns, Bloch, and the world premiere recordings of the Muhly and Daugherty Works for Cello and Orchestra. Kalmus “Ludwig Masters” has released his musical editions of the core repertoire in celebration of his appearances and recordings. Mr. Bailey performs on the “rosette” 1693 Matteo Gofriller Cello, formerly owned by Mischa Schneider of the Budapest String Quartet. He is the Artistic Director of El Paso Pro-Musica (Texas), the Sitka Summer Music Festival/Series and Cello Seminar (Alaska), the Northwest Bach Festival (Washington), guest Artistic Director of the Mesa Arts Center (Arizona), and Professor of Cello at the University of Texas-El Paso.